Mariaichi Mariposas Lorena Lopez, Karla Perez, Rosalba Benavides and Vanessa Galvan during practice Thursday, April 12, 2018, in Edinburg. Existing as one of the few all-female mariachi groups of South Texas is not a distinction taken lightly by the Mariachi Mariposas. “Our goal is to represent women in a strong sense,” founder Mayra Garcia said. In 2012, Garcia created the group with a few musicians she knew; over the years it has expanded to include additional talents. The mariposas, who have come to be recognized by their purple traje de charro, celebrated a first-place victory in March during the 27th annual Mariachi Invitational competition at the Houston Livestock Show. Waiting on stage before the winner was announced, Nicole Guzman recalled, was “overwhelming in a good way.” All that was visible, she said, were a bunch of lights in a sea of pitch black. Due to their schedules and outside careers, performances typically happen during weekends. Rehearsal is often once a week. When a competition approaches, however, they gear up with more frequent practices, which take place at one of the member’s homes. Sounds of the brass instruments included in the performance can be heard blaring from their homes far down the block. Nine of the 13 members are music educators in public school districts — including La Joya, Donna, Edinburg and Hidalgo. They agree that there’s a flourishing mariachi industry in the Rio Grande Valley and its schools. Up to state level, UIL offers a competitive mariachi festival. Since coming together, the ensemble has had much prosperity. The 2018 livestock show win was the second for the group. In 2014, they took home the same prize and have been invited to attend mariachi festivals nationwide. Later this year, they plan on returning to California, home of the Mariachi USA festival. A dream come true, they said, would be to receive an invitation to the Hollywood Bowl. One of their favorite times to perform, said Garcia, is for local, public events. This year they performed during Onion Fest. “The Valley has been really good to us, so we try to do at least one or two (public performances) a year so we can expose ourselves to the community,” Garcia said. According to the members, they have performed before an audience of as many as 75,000 people. Stage fright, however, isn’t much of an issue. 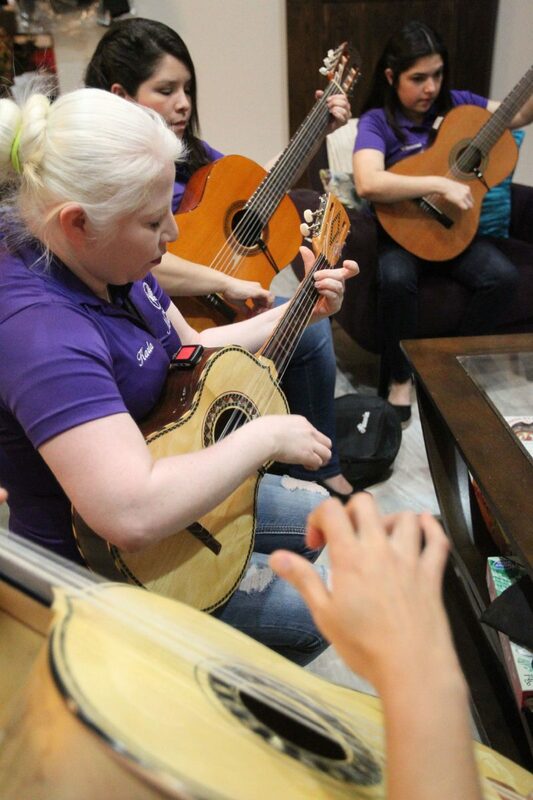 Most of the members got their start through middle or high school mariachi programs offered by their schools; several graduated from then-University of Texas Pan-American (now UTRGV) and were involved in the Mariachi Azatlan group. In determining the group’s name, how they will forever be known, several factors were weighted, including the evolution of insects. Staying true to tradition is a priority for the mariposas. Namely they perform Spanish songs, a few favorites being those by Vicente Fernandez and Juan Gabriel, but sing “outside of the genre,” if requested by a booker. “We love rancheras… anything that belts our voices,” member Elizabeth Salinas-Pagan said. Uniformity is important to the group. Hairstyle, makeup and attire are worn in similar fashion when performing. Other groups they’ve gone up against or have witnessed perform, they said, have evolved to more contemporary apparel. However, they “safeguard tradition” by staying true to the classic traje de charro — they have four distinct uniforms, three purple and one pink. With no official release date yet set, they plan on releasing an album by the end of this year. Keep up with the Mariachi Mariposas on their Facebook page or website, mariachimariposas.webnode.com.